If you spend any time on the Internet, there’s a good chance you’ve seen an advertisement for a weighted blanket. Though they’ve been used for therapeutic purposes since the late 90’s, weighted blankets have recently skyrocketed in popularity, and are said to help folks of all ages get a good night’s sleep. So, to find out what all the hype is about, I surrounded myself with over one hundred pounds of weighted blankets from some of the most popular brands on the market. If you’ve been wondering what a weighted blanket is, how it works, and what specific models look like — this roundup is for you! The YnM weighted blanket is great for folks looking for blankets for the whole family! YNM offers a large selection of styles, weights, and sizes. The Gravity Blanket comes in 15, 20, or 25 lbs and is great for trendy sleepers looking for a popular name brand. Gravity Blanket is arguably the most recognizable brand on the weighted blanket market. The Mosaic blanket is weighted with hypoallergenic plastic pellets, and Mosaic makes weighted blankets for kids and adults. So, you can purchase this blanket in weights ranging from 5 lbs to 20lbs. The Blanquil is the perfect weighted blanket for sleepers who want the option to choose between the soft, warm feel of the original Blanquil, or the cooling caress of the Blanquil Chill. 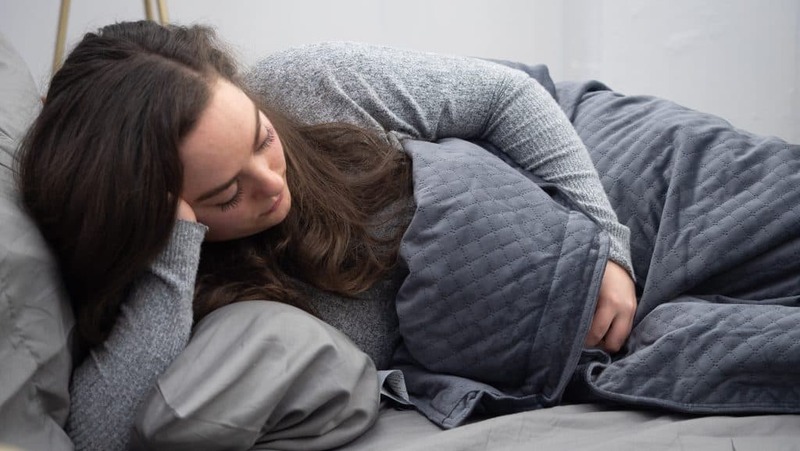 The Hush is the perfect weighted blanket for the indecisive sleeper! Hush offers a generous trial period of 100 nights so that you can thoroughly test this blanket out before you commit. The ZonLi is a great weighted blanket option for those on a budget. It's covered in cotton and filled with hypoallergenic, non-toxic glass beads. If you love Layla’s mattress and pillow, this weighted blanket might be the perfect accessory to round out your collection of Layla bedding. 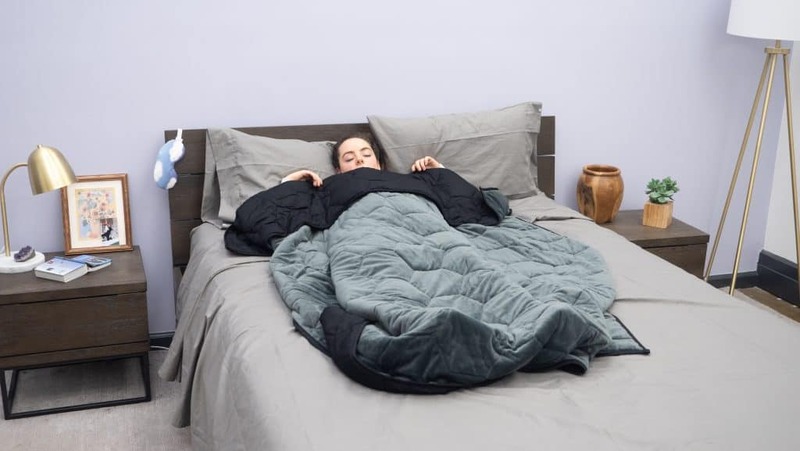 The CMFRT weighted blanket is a great option for those looking for some versatility as one side of this blanket feels cool and breathable, and the other side feels plush and warming. First Thing’s First: What Is A Weighted Blanket? For this review, I’m fortunate enough to be exploring blankets from some of the most popular weighted blanket brands on the market. We’re looking at Mosaic, Hush, Zonli, YNM, Blanquil, CMFRT, and (arguably the most popular) Gravity Blanket. But before we take a close look at each one, you might be wondering what a weighted blanket even is. Well, simply put, a weighted blanket is a blanket that features an internal liner with several sewn-in pockets that have been filled with a weighted material. Typically, the weighted material consists of plastic pellets or glass beads, but some companies fill their blankets with a proprietary material. The primary purpose of the weight is to offer sleepers what’s known as Deep Pressure Touch. Deep Pressure Touch has been employed by therapists for decades (particularly within the special-needs community) to alleviate anxiety, PTSD, ASD, and a host of other sensory processing disorders. And while weighted blankets have recently peaked in popularity, they are still primarily used to aid in relaxation. So, how does Deep Pressure Touch aid in relaxation, you ask? Well, in my conversation with occupational therapist Annie Schlecht of the Sleepopolis Expert Network, I learned that the weight of the blanket releases serotonin (our happy neurotransmitter). In turn, the serotonin promotes the release of melatonin (our sleepy hormone). (1) So, essentially, weighted blankets are meant to make you happy, sleepy, and calm (no wonder they are so popular!). So, now that we know a bit about what a weighted blanket is and how it works, let’s take a look at some specific examples! Okay, the first blanket I want to show you is from YNM. I’m looking at YNM’s original weighted blanket, but the brand does offer a pretty wide variety of blankets for both kids and adults. The cover fabric of this blanket is made from 100% cotton which offers a soft, breathable feel. On the inside of the blanket’s sewn-in pockets are hypoallergenic glass beads (which are, of course, what’s giving the blanket weight). Surrounding the glass beads is a light fiber fill which is designed to add a little more cushiony comfort, and also serve as a buffer for the beads so you don’t hear them clink together as you shift around in bed. Now, the blanket I’m looking at here is 20 lbs, which is on the heavier end of the spectrum. Typically, weighted blankets don’t exceed 25 lbs in weight, and YNM offers this blanket in weights ranging from 5 -25 lbs. As I said, the weight is meant to provide Deep Pressure Touch, which both adults and children can benefit from. However, children should use the lighter blankets in the 5-10 lbs range. A weighted blanket should be about 10% of your body weight (give or take a couple lbs). For example, adults weighing 150 lbs should use a 15 lb blanket, and children weighing 50 lbs should use a 5 lb blanket. 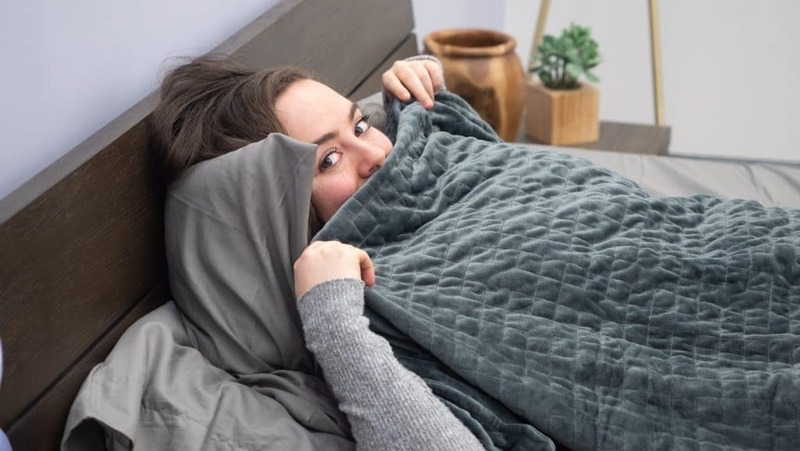 Pricing: This YnM weighted blanket ranges from about $85-$200, which might seem like an oddly wide range — but that’s kind of how it goes in the weighted blanket world. In general, the price depends upon the weight you choose. Perfect for: Folks looking for blankets for the whole family! Of all the brands in this roundup, YNM offers the largest selection of styles, weights, and sizes. Okay, up next is one of the most (if not the most) popular weighted blankets on the market — the Gravity Blanket. 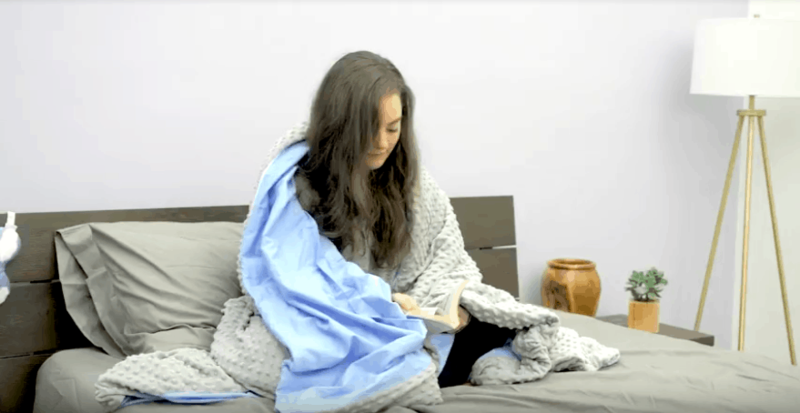 Unlike with the YNM blanket, the Gravity Blanket features a removable duvet cover. So, the weighted blanket itself is covered in 100% cotton, and filled with fine-grade glass beads. For a little extra comfort and style, the weighted portion of the blanket is secured within a very soft duvet cover made from microfiber. The duvet cover is, as I said, very soft — but it’s also quite warm. So, should you choose to remove the cover, simply unzip, unclasp, and pull the weighted blanket out! When you want to put the cover back on, use the internal clasps to hook the loops that surround the perimeter of the blanket. This way, you can make sure the weighted portion of your blanket isn’t moving around within the duvet cover. The Gravity Blanket comes in 15, 20, or 25 lbs so, unlike some of the other brands we’re looking at here, these are only made for adults. Again, your weighted blanket should generally be about 10% of your body weight, give or take a couple pounds. So, you’re not going to want to use any of these weights for young children. Now, that being said, I’m testing the 25 lb blanket here, which is technically out of my target zone. I’m about 130 lbs, so I’m most compatible with a 15 lb blanket. So, while I was pretty impressed with the force of the 25 lb Gravity Blanket, I felt that it was too heavy for me. Pricing: Something interesting about Gravity Blanket is, no matter which weight you choose, the price stays the same at $249. Personally, I like that the price doesn’t increase with the weight, as is usually the case. Perfect for: Trendy sleepers looking for a popular name brand. Gravity Blanket is arguably the most recognizable brand on the weighted blanket market. The next blanket I want to show you is from Mosaic, and it’s called Blue Minky. Of all the blankets we’re looking at here, this is definitely one of my favorites because it’s covered in this insanely plush minky material. Because of the luxuriously soft nature of the minky cover fabric, this blanket is a little more expensive than some of Mosaic’s other weighted blankets. However, in my experience testing this blanket, the plush cover fabric offered a unique comfort that I did not experience with the other blankets. Additionally, there are dozens of little “dots” adorning the cover fabric, which are said to offer comforting stimulation for the skin. This blanket is weighted with hypoallergenic plastic pellets, and Mosaic makes weighted blankets for kids and adults. So, you can purchase this blanket in weights ranging from 5 lbs to 20lbs. I’m testing the 15 lb blanket here which, like I said, is best suited to my personal body weight. Something to be aware of when using your weighted blanket is the time. Because weighted blankets are frequently marketed as “sleep accessories,” some folks might think that it’s fine to sleep with one on your body all night long. However, in my conversation with sleep expert Annie Schlecht, I learned that using a weighted blanket for hours at a time is not recommended. Instead, it’s best to use weighted blankets for periods of 20-30 minutes at a time to prevent muscle fatigue. Use your weighted blanket for 20-30 minutes at a time. When you take the weighted blanket off, give it a rest for 90 minutes to two hours. Leaving a weighted blanket on your body for hours can cause muscle fatigue, or even make you desensitized to the calming effects of Deep Pressure Touch. Pricing: The Mosaic Blue Minky ranges from $145 to $255 depending on the size and weight you choose. Perfect for: Sleepers who love a super cozy and soft cover fabric. In my opinion, this blanket offers the softest, most plush feel. Snuggling under the weight of the Blanquil. Okay, next up is the weighted blanket from Blanquil. Similar to the Gravity Blanket, it features a super soft and removable duvet cover. The duvet cover is made from polyester fleece, and features the brand’s signature quilted design. The weighted portion of the blanket inside the duvet cover is filled with glass beads, and covered in a blend of cotton and polyester. I’m testing the 20 lb blanket, but Blanquil offers this blanket in a 15 lb option as well. Now, because this blanket is only offered in 15 and 20 lbs options, it’s not ideal for folks who weigh too much less than 150 lbs. However, Blanquil does offer a cooling weighted blanket called the Blanquil Chill for sleepers who run hot. The cover fabric of the Blanquil Chill is a proprietary material designed to be cool to the touch, and wick away moisture. So, while there are only two weight options, folks do have the option to choose either the original or cooling blanket. As I said, I’m testing the original Blanquil in the 20 lb weight, and I found the distribution of pressure to be pretty balanced. As with the Gravity Blanket, hooking the loops that surround the weighted blanket to the internal clasps within the duvet cover will keep the blanket from bunching up and feeling unbalanced. Pricing: The Blanquil ranges from $169-$249 depending on which weight you choose, and whether you pick the original or the Chill (the Chill is more expensive). Perfect for: Sleepers who want the option to choose between the soft, warm feel of the original Blanquil, or the cooling caress of the Blanquil Chill. Relaxing under the Hush weighted blanket. 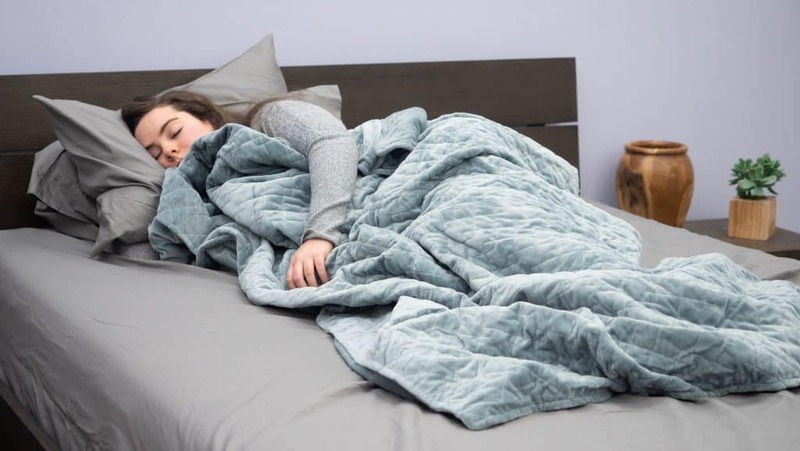 Similar to the Gravity Blanket, the Hush blanket is covered in a very soft duvet cover made from microfiber (which is pretty fun to pet). The weighted blanket itself is covered in a layer of cotton, which provides some nice breathability. However, the microfiber duvet cover is quite warming. So, folks who run hot or want a lighter, cooler feel might want to remove the duvet cover before using this blanket. You’ll notice that weighted blankets are usually not categorized like other bedding (Full, Queen, King, etc.). Instead, you are provided with their exact dimensions. In general, though, the average weighted blanket is the size of a throw blanket, as it’s designed to cover your body (not the whole mattress). Again, because this duvet cover is removable, you’re going to want to secure the weighted blanket inside the duvet cover using the loops. Otherwise, the weighted portion will sink to the bottom of the blanket! Pricing: Depending on which weight you choose, price ranges from $159-$179. Perfect for: The indecisive sleeper! Hush offers a generous trial period of 100 nights so that you can thoroughly test this blanket out before you commit. Resting beneath the Zonli weighted blanket. Next up in the weighted blanket from Zonli which, in my opinion, is most similar to the blanket from YNM. The Zonli is covered in cotton and filled with hypoallergenic, non-toxic glass beads. The cotton provides a soft, breathable feel, and the sewn-in pockets do a good job of keeping the weight evenly distributed. I’m testing the 15 lb blanket, though Zonli offers blankets ranging from 15 to 22 lbs in weight. Something I like about the Zonli website is that it outlines which blanket is the ideal weight for you. For example, if you click on the 20 lb blanket, the target weight range of 170-200 lbs will pop up so that you can better determine if you fall within that bracket. Personally, I really like the cool cotton feel of the cover fabric. However, Zonli does offer sleepers the option to purchase a plush, microfiber duvet cover to complement the blanket. Pricing: Price ranges from $75-$112, making this blanket the least expensive on our list! Perfect for: Folks on a budget! This is the least expensive blanket on our list, but certainly doesn’t sacrifice any quality. Snuggling under the cotton side of the Layla weighted blanket. 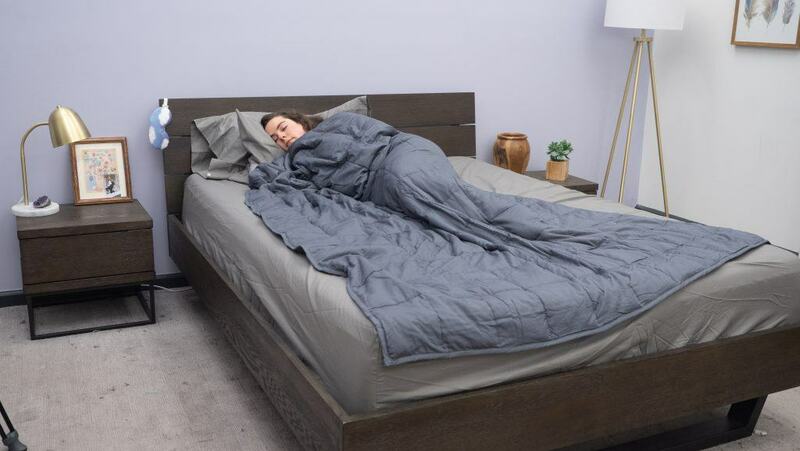 Now, some of you may already be familiar with the Layla mattress or the Layla pillow — but now the popular bed-in-a-box brand has released its first weighted blanket! The blanket is covered in cotton which feels cool and breathable to the touch, and it’s weighted with glass beads. Layla offers its weighted blanket in Twin, Queen, and King options — and I’m testing the Queen size here. Something cool about this blanket is that one side is cotton, and the other side is a plush, microfiber material that feels super soft. So, again, sleepers can choose which side they prefer to be directly on their skin. Of all the blankets we’re looking at here, this is the only one that comes in its own reusable carrying case (which I think is a nice touch). This way, if you’re traveling or spending the night at a friend’s house, you can still take your blanket with you! Perfect for: Layla loyalists! If you love Layla’s mattress and pillow, this weighted blanket might be the perfect accessory to round out your collection of Layla bedding. Enjoying both sides of the CMFRT weighted blanket! And finally, we have the weighted blanket from CMFRT. Personally, I find this weighted blanket to have the most interesting construction. On one side of the blanket, folks can enjoy a soft, minky cover fabric covered in those skin-stimulating “dots” (very similar to Mosaic’s Blue Minky). And on the other side of the blanket is cool, breathable cotton. So, you can choose which cover fabric is directly facing your skin according to the feel and temperature you’re going for. The minky side of the cover is grey, and the cotton side comes in bright, light blue. So, in my opinion, this color combination adds a nice aesthetic flare. Should you not want to use the cover fabric at all, it is removable — and the weighted blanket itself is covered in cotton. The weighted material in this blanket is a proprietary silica blend, which the folks at CMFRT say promotes a more even distribution of weight. While the particular CMFRT blanket I’m testing only comes in 16, 20, and 25 lb options, the company offers blankets specifically built for children and teens as well. The weighted option for teens is 12 lbs, and 5 and 7 lbs for children. Pricing: $89-$189, which includes pricing for children, teen, and adult CMFRT blankets. Perfect for: Folks who like a dual construction! One side of this blanket feels cool and breathable, and the other side feels plush and warming. Well, there ya’ have it, folks. Weighted blankets come in all different styles, but they are all meant to offer relaxing Deep Pressure Touch. So, whether you’re trying to alleviate anxiety, or just enjoy the calming effects of DPT, weighted blankets can be a great bedroom accessory for people of all ages. Just remember to follow the weight and time limitations so that your weighted blanket experience is both cozy and safe. Bestbier, Lana, and Tim I. Williams. “The Immediate Effects of Deep Pressure on Young People with Autism and Severe Intellectual Difficulties: Demonstrating Individual Differences.” US National Library of Medicine National Institutes of Health, 2017, www.ncbi.nlm.nih.gov/pmc/articles/PMC5612681/.